Our love of Disney villains is a lot more complicated than you might think. 101 Dalmatians is ostensibly about cute little animals and quaint 1950s London, but many of us remember it most for one thing: the image of Cruella de Vil’s bloodshot eyes as she tears into the night looking for dogs to skin. Few characters in the Disney pantheon are more iconic. She even has her own much-loved theme song. What gives? Throughout the years, our love for villains has flourished nowhere more noticably than in the popular animated tales of our childhood. Disney’s recent Maleficent may be the first time the studio has been so open about catering to the massive fanbase for its many memorable evil-doers. But it doesn’t stop there. Disney has actually been catering to that love in a number of recent films. You just might not have noticed. The message couldn’t be clearer, or more perfectly timed to coincide with the release of Maleficent. Disney’s marketing branch knows that you love rooting for the bad guys. Cruella is all about sparkle, from the jade green stones in her earrings and ring to the diamond-shaped stone in her plunging neckline. Cruella’s sparkling jewels and dress give her a modern, flashy look, while her trademark fur coat and hairstyle pay homage to her classic look. Plunging neckline? Sparkle and flash? Isn’t this taking too much villain out of the villainness? Not exactly. Disney villains have always been, well, of a type. Yeahhhhhhhh. How we’d all like to forget that this actually happened. Note that the recent cover edition removes the destinctly racist overtones of the Siamese cat design, particularly the cross-eyed appearance and the two front teeth typical of vintage Eastern stereotypes. You might hope that in recent years Disney has started to question and move away from these tropes—and you’d be right. Check out the appearance of King Candy, the archvillain in Wreck-It Ralph. King Candy’s roly-poly appearance is significant on numerous levels. He represents the kind of physical archetype that’s usually indicative in animated films of the bumbling but well-meaning old man. Unfortunately, there’s another glaring issue here: With his pink bow tie and slipper bells, purple suit jacket, stylized pose, and dandy-ish appearance, King Candy illustrates another problem that plagues male Disney villains: sissification. Male characters who display “effeminate” characteristics in films may be code for multiple things: upper class status and prudishness are common. But by far the most common is the association of effeminacy with homosexuality. A character who preens, prances, and wears purples, reds, and pinks is not to be trusted in the Disney kingdom. With the exception of the wicked stepmothers from Snow White and Cinderella, and Rapunzel’s evil surrogate mother in Tangled, most of the female villains in Disney films have rejected traditional social roles as wife and mother. The wicked stepmother is itself a holdover from traditional fairy tale tropes that paint surrogate or non-biological family bonds as false, evil, or superficial. Tangled’s Mother Gothel just sees mothering Rapunzel as a means to an end. In fact, just looking at Disney’s “old hags” reveals a fun and a playfulness that brings out the admiration in all of us. Let’s face it. We all have a wild child inside, and nothing brings out the evil in all of us like the delightful fiendish glee of a Disney villain. Sure, there may be some problematic elements involved in the way these tropes play out over the years, but when you come right down to it, does any of that matter in the face of how awesome these bad guys are? I mean, who among us hasn’t wanted to skin the neighbor’s ugly little yippie dog and turn it into a fur coat, or skewer that stupid cute singing fish? After all, it’s the villains who bring us many of the most memorable moments in all of the Disney classics. What’s the thing you remember most from Bambi, again? That’s right: Man, the ultimate evil. One of the things villains allow us to do is not only root against the bad guy, but occasionally for the bad guy. Clearly there’s more going on here than just a wish to turn the tables. It’s actually easy to admire many of the Disney villains, even at their absolute worst—some for just how much style they bring to the business of evil-doing, and others for just how committed they are to their dastardly ways. So what happens when you have a villain who’s not just a shallow one-dimensional bad guy? For this reason and more, the character of Regina from Disney and ABC’s Once Upon a Time is an especially interesting figure in the pantheon of Disney villains. On the surface, Regina is meant to be an amalgamation of a number of different Disney villain tropes: the evil queen, the wicked stepmother, the power-hungry ruler. In reality, while she does commit murder and other cold acts, she’s also shown to be a complicated and ultimately loving surrogate mother for her adopted son Henry. Once Upon a Time enjoys a rabid cult fandom in part because of the popularity of Regina as a character, and the large section of the fandom that ships Swanqueen, or the potential lesbian relationship developing between Regina and main character Emma Swan. But Once Upon a Time‘s popularity also reveals the growing interest in a new kind of Disney fairy tale: postmodern, revisionist revisitations of beloved Disney classics. While this kind of take on the villain’s POV is facetious, it set the stage for the further examination of Disney’s classic texts to come. Recent Disney films have been textbook cases in deconstructing and remixing the timeless tropes that Disney’s animated films spent decades firming up to begin with. 2012’s Wreck-It Ralph, which is all about breaking down the concept of the good guy/bad guy dichotomy, follows in the footsteps of Pixar’s The Incredibles in its exploration of what it means to be a hero. The recently announced Disney Channel movie Descendents seems to be a Disney villains fanfic musical, with pixie-sized Broadway star Kristen Chenoweth, of all people, playing Maleficent. Enchanted (2007) deserves mention as a kind of stepping stone toward what seems to be the new era of Disney deconstruction. A partially animated, live-action satire of the princess narrative, Enchanted utilizes wacky sendups of familiar Disney tropes, like princesses warbling their way through housework. In the end, while it still delivers a cheesy and tidy fairy tale ending, it takes an axe to love at first sight, an idea further dismantled in 2013’s blockbuster hit Frozen. And 2010’s Tangled continued the trend by tackling the idea of damsels in distress: Rapunzel doesn’t wait around to be rescued from her surrogate mother’s tower. In retrospect, all of these tales seem like practice runs for Disney’s most recent offerings. Frozen originally had icy Queen Elsa as the movie’s true villain. What changed? When the film’s writers heard Elsa’s centerpiece song “Let It Go,” they realized they couldn’t simply let Elsa go unredeemed. Instead, while her sister Anna remains the true heroine of the fairy tale, Elsa has proven incredibly popular with Disney fans, who have churned out endless amounts of fanart and YouTube covers of her signature song, as well as an entire sub-fandom devoted to shipping her with Rise of the Guardian’s Jack Frost. Similarly, the new Maleficent doesn’t try to villainize its titular character, even though as the villain from Sleeping Beauty she is often considered the most fearsome and powerful of any Disney villain. Instead, the work of the film is to humanize her, giving her a complex backstory and creating a deep bond between her and princess Aurora. 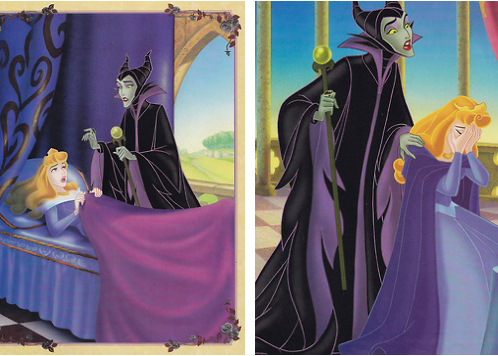 Ultimately, the film jettisons the original ending of Sleeping Beauty altogether, in order to allow Maleficent to write her own version of the ending. Finally, there’s the upcoming highly-anticipated Christmas release of the classic Sondheim musical Into the Woods, which literally wrote the book—OK, the libretto—on the kind of hybrid, chaotic fairy-tale crossover drama that Once Upon a Time has more or less turned into character soup at this point. While Disney’s adaptation of the film is inducing literal cries of alarm from fans horrified over the studio’s plans to simplify and censor many of the musical’s darker themes, Into the Woods is still a story in which the “villains” work with the good guys, and the story’s narration can be thrown away altogether in favor of something new. For Disney to align itself with that kind of message is a clear a meta-statement about the studio’s own evolutionary path. Ultimately, Disney’s increasingly sympathetic take on villains seems to be a combined product of marketing, revitalizing old titles, and responding to a changing fandom that thoroughly critiques Disney properties. While revisionist fairy tales like Maleficent may seem like an attempt to soften the edges of the villains we love, it’s really just a way of expanding what we love about them. And, of course, for those fans who like their villains to remain bad to the bone, there’s still plenty of evil left in the Disney pantheon. It’s just updated its wardrobe.